Did you know that the Qur’an has a lot to say about Jesus? 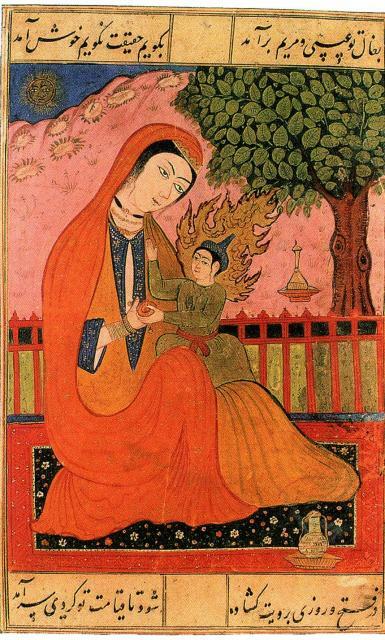 Virgin Mary and Jesus, old Persian miniature. In Islam, they are called Maryam and Isa. Surah 2:136 and Surah 4:163 say Jesus is a prophet. Surah 22:91 and Surah 23:50 say that Mary was a virgin who Allah made pregnant with Jesus through his Spirit. Surah 4:157 says that Jesus was not killed, nor crucified, and the next verse, 158, explains that Allah raised Jesus to heaven (The Ascension in Christian terms) in both body and spirit.